Today is the day you get to hear Puddles Pity Party perform a mashup of Johnny Cash and The Who. It's a mashup that you probably didn't know you wanted to hear. But once you do listen to a mournful-looking clown mesh together Cash's "Folsom Prison Blues" and The Who's "Pinball Wizard" you'll be totally glad that you did. Because it's something else. Something unexpected. Something brilliant. 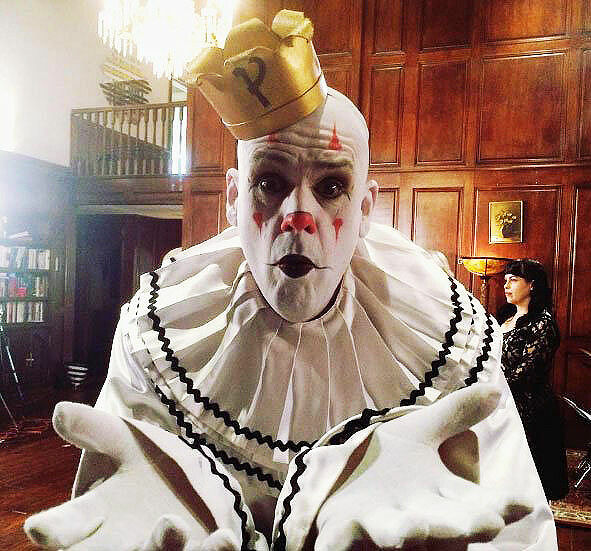 Puddles Pity Party, if you don't know, is a 7ft singing clown and the chosen persona of musician Big Mike Geier who heads up the Georgia-based band Kingsized. As Puddles he also posts videos to his YouTube page performing various covers of popular songs. And, of course, he does this while dressed up in the iconic Pierrot white clown costume, complete with red nose and face makeup. it sounds like a recipe for disaster. But it isn't. Because Big Mike Geier has an incredible voice, a voice that reminds you of the great Johnny Cash no less. So looking like that, and with a great voice too, it would probably be enough to see and hear Puddles Pity Party just perform a cover of the signature Johnny Cash song. You know the one, it's the song that features the classic line ""But I shot a man in Reno, just to watch him die." But it doesn't stop there because Puddles goes one better, because he somehow seamlessly manages to merge the music of Cash's country blues track with the lyrics of The Who's power rock ballad "Pinball Wizard," taken from their Rock Opera Tommy. The resulting mashup is quite something and works so well it's alarming. Because when you start listening, the lyrics suit the jangly tune so well you don't even realise that they're not actually the original ones. you think you are hearing Folsom Prison Blues, but then you realise the lyrics aren't right. It's like they were made for each other, even the songs came out nearly 25 years apart. The only nod to the famous guitar riff from "Pinball Wizard" comes around half way through the mashup, when Puddles Pity Party mimes playing a fake guitar, strumming a few chords, before it's back to the rockabilliy of "Folsom Prison Blues." I can guarantee that you will definitely play the Puddles Pity Party video more than once. It rules. Check out the original tracks below.